Indian Oil corporation (IOC) Stock prices were trending upside since Oct 2016. Consider the stock prices on 4h chart, from a swing trading perspective. The trend that become intact from 280.00, rallied till 400.00 within a period of 3 months. Currently the share prices are trading around 390.00. But now the Trend seems to be losing momentum. Feels like the stock is due for a correction and might potentially result in intermediate retracement. If we look at the Price action on weekly chart, it becomes obvious. Oil and Gas sector was one of the best performers in 2016 (Partially due to Higher Oil prices). Relatively many stocks outperformed each other. But when Q3 results came across with missed expectations, performance started lagging behind. 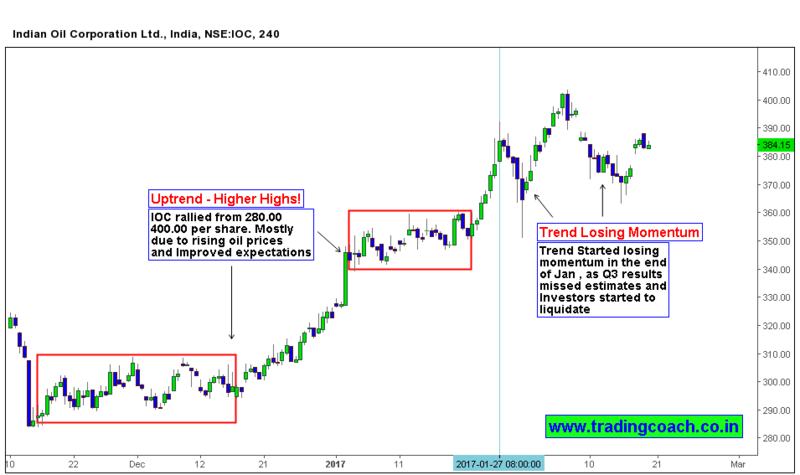 The Price action of IOC was similar to what we are seeing in entire sector. When Q3 result missed estimate, Investors started liquidating their holdings. As a result, earlier trend lost momentum. We need to see how buyers will react from here on wards. I will be keeping an eye on this stock; it will be in my Price action trading watch list on upcoming days, as it can offer good trading opportunities.